Reliable all year round, the Kinergy 4S (H740) provides enhanced performance and safety no matter the weather. This tyre has been designated with the mountain snowflake symbol, indicating its cold weather capabilities. This tyre provides enhanced traction on snow covered surfaces thanks to its specialist broad-lateral grooves which provide a smoother flow over snow and water. 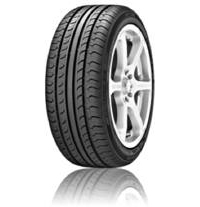 The Kinergy 4S (H740) also achieves low rolling resistance thanks to a high grip silica compound.